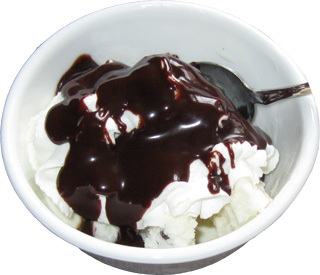 Well happy 119th anniversary of the first print record of the ice cream sundae! wait, what? Yeah, there is a small debate going on about what today means to sundaes, but all I know is that it's an excellent time to mention something that's in our fridge. This is Santa Cruz organic raspberry chocolate flavored syrup, and I picked it up from Whole Foods awhile back because I do love raspberry. Throw in the fact that it's organic and it seemed like a shame not to try it. The first word that comes to mind? POTENT. This stuff has a potent smell as well as a potent taste. It's smells like a raspberry fudge truffle or some other sort of infused treat. I guess I expected a cleaner taste from something organic but I don't think I have the power to discern this from any other artificial syrup, it's just too strong. It didn't even really finish nicely. I was stuck with the aftertaste for awhile yet the whole treat experience wasn't even really satisfying. So, this will cover pretty much whatever you put it on. I've used this twice and I tried to be more careful the second time, but even then I put on too much. Next time I would probably save this for some black raspberry ice cream, and probably throw in some chocolate chips for crunch. This stuff definitely needs something to break it up. Note: Just for the fun of it, I tried mixing it into some milk. BIG MISTAKE. It was terrible, ewww.